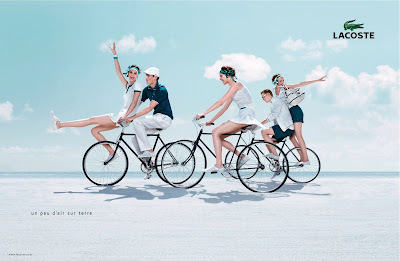 Add Lacoste to the long list of brands hopping on board our little Cycle Chic movement. Lovely summer shots. LOVE this image!! *very* retro ... like the old travel ads. I run into this advert this morning at the barber. It's a lovely shot, cycling chic it's all over... But... good or bad when publicity takes over ? Good! But good luck with those white pants and those fenderless, changuardless bikes. in german newspapers i saw this photo too. and the bike with the single lady has it's chain ring on the left side, just as the last bike seems to have it too - they photoshopped it to change direction. Where can I buy a bike like these?